Those stories hidden in the dark of night, kept under cover, the lid closely guarded and locked, cannot breathe or break free from shame, guilt or sadness that are a part of their very nature. Until the lid is opened, until the light can shine down upon the dark shadows, to chase them out and loosen the ties that hold the story closed, there will be no healing. 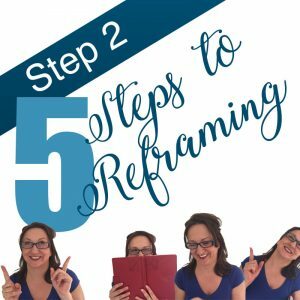 Join us today for Step 2 of the 5 part reframing process. Tell Your Stories! So, here we are in week two of our five-week series. I hope your work with the acceptance of your stories has been productive this past week. Moving onto step two this week, we come to the point of TELLING OUR STORY. It’s time to say it out loud. To put it into words. Before some of you start hyperventilating with the idea of this type of exposure and vulnerability, this does not mean you should run out and post your most shame filled or difficult stories on Facebook, or announcing them in the city square. It means coming to a point of claiming them, where you can put into words your stories, in a safe space. A space where you are able to put words to even your deeply disturbing stories that have remained silent, in one way or another. Becky Andrews, a therapist at Resilience Inc, a guest we’ve had speak on the podcast, episode 022, explained to me, telling our stories is invaluable, we must talk and share our stories, she said. We know that studies indicate that talk therapy – thus sharing our stories, actually lessen the intensity and stress in our brain. So, I asked a woman who had done the Next Level emotional intelligence leadership workshop about her experiences in telling her stories. She went on, “Another experience was an exercise where you were forced to just keep talking while you really got to the bottom of things. This gave me the opportunity to finally say out loud how I feel about my mothering. It has been tough dealing with my son’s Aspergers, ADHD, and mood disorder. I experienced shame and heartache over how I had handled different situations in weakness, and heartache over the situation as a whole. Saying it out loud to a male that was there representing my son was cleansing. Saying it out loud is a necessary step to healing and moving on,” she finished. Often times the thing we will gain from telling our story, from putting it into words, is not something we will fully understand until it is done. Perhaps it is like Jamie, where saying it out loud, giving it voice releases all the stories tied to it. Perhaps it is her experience of putting into words, in a mad unorganized rush, her story and guilty feelings about dealing with her son’s difficulties that actually give the story form and increased understanding. But sometimes it’s just the bravery of claiming it that sets you free to accept it, to accept yourself and your deeply personal identity that is foundationally built upon our stories. Sometimes in the telling you find others with similar stories and you are able to find support and community. You’ll notice in the examples I shared earlier that there were others listening or prodding, or bearing witness to the stories being told. I have found that reframing a story is most often NOT a one-person job. We are so entrenched in our stories that often the view of an outsider is what gives us another angle to consider. I did not reframe my stories without help. Becky Andrews, as a therapist, helps clients get perspective on their life stories all the time. Sometimes it is the perspective brought by another that serves as a key that unlocks the stuck story, or it is just the words, open to the light, that allows release. There is no question that claiming, accepting, and reframing our stories is a process, but this process cannot be done with stories that are buried and held hostage in our own fear. Sharing our human experiences, has always, throughout all time, been a way of connecting. It is not new to share our stories, but sometimes it is extremely uncomfortable or painful, especially when shame or guilt is involved. Find a safe place. Put words to the stories that are hard for you, the ones that have you listening to this podcast because you want the reframe. The one you don’t want to tell most of all. These are the ones that need to be told so that you can find support, freedom from shame, acceptance. Pull them out from under your bed, open the door and let the light in. Be brave enough to claim your own stories. There is a deep liberation and release from the chains we let bind us in our hidden stories when we say them out loud and claim the story only we know how to tell. These stories don’t define us, they need not hold us hostage. In Step #3 we take the next crucially important step of finding the meaning and purpose behind the experience. Join me next Wednesday for Step #3 – maybe the most satisfying of all five steps.